Aviation watchdogs have ordered more safety checks and upgrades on Super Puma helicopters. The European Aviation Safety Authority has issued fresh Airworthiness Directives for the AS332L2 and EC225 aircraft. The Airbus manufactured choppers were banned from flying in the UK until recently after a fatal crash off Norway which killed 13 people. During investigations into the incident, fatigue and surface degradation was discovered in the main gearbox. This led to the grounding of UK and Norwegian operations until it could be determined if this was a contributing factor to the accident or if it was a consequence of another fault. It is thought the rupture of a second stage planet gear “likely” caused the Norway accident but the root cause of the failure is still not understood. The CAA announced plans to lift the flight ban earlier this month despite this being the case. The move was met with anger from workforce representatives who claim that there is no need for the aircraft since alternatives were sourced. The new CAA directive states that if a helicopter operators wants to return a Super Puma to service they must carry out certain “in-house” upgrades. The work includes complying with a previously issued ‘airworthiness directive’ which called for increased maintenance checks on a gearbox particle detector and oil cooler inspection as well as the replacement of the second stage planet gear assembly. Super Puma operators must also fit a Full Flow Magnetic Plug to support the inspection of the main gearbox oil system particle detection and a full safety case must be prepared. Now additional maintenance checks and safety upgrades have been issued by EASA. The work includes replacing parts of the second stage planet gear assembly as well as an upgrade to the Full Flow Magnetic Plug. A separate Airworthiness Directive also asks operators of the two aircraft variants replace pins on the main gearbox suspension bars. This is to prevent tightening torque loss. EASA added: “The condition, if not corrected, could lead to structural failure of the main gearbox suspension bar attachement pins and/or fitting”. Metal particles broken off from the fast moving gearbox parts, known as spalling, are thought to have played a part or indicated an issue in several helicopter accidents in recent years, including the 2009 crash off Peterhead which claimed 16 lives. These particles are normally ‘detected’ by magnetic plugs which pick up the fragments and alert the pilot, typically resulting in the crew putting the aircraft down safely. However Super Puma manufacturer Airbus now wants to improve the detection rates of gearbox spalling by fitting these additional safety measure. It comes after a test revealed that the total detection rate – the % of all free magnetic particles expected to be collected on the plugs – was just 12%. Airbus is currently canvassing opinion about the safety overhaul made in light of the Norway crash. The preliminary report from the the Accident Investigation Board Norway states that Airbus launched a main gearbox spalling test program following the G-REDL accident in 2009. The single test, presented to the AIBN, showed that the total detection rate – % of all free magnetic particles expected to be collected on the plugs – is 12 %, while 44 % of the particles were said to end up in the oil filter. As a direct result of Unite the union members working in the offshore Oil & Gas sector raising their serious concerns in relation to the reintroduction of the Airbus Superpuma H225LP and AS332 L2 helicopters Unite is running a petition the ‘Back Home Safe 2017 `campaign to demonstrate the offshore workers and families and the general publics no – confidence in these airframes. Our petition calls for all stakeholders to back the non-reintroduction and the permanent cessation of commercial operations in the UKCS. Unite members have a vital role in making this campaign a success. Together we need to show that workers will not accept a return ‘business as usual ` and will express a vote of no – confidence in the Airbus Superpuma 225s airframes. Unite members have told us, their Health & Safety is paramount in the offshore sector. We are asking our members and all offshore workers and their families and the general public to visibly support this campaign and future health and safety campaigns in the industry. To win, you will need to show publicly your support and you will need to build the campaign through speaking to your colleagues, gaining their support and asking them to play an active role. Thirty thousand workers are employed in the UK Oil & Gas Industry; thirty thousand voices united will not be ignored. The Prime Minister instead sent the Scottish and energy secretaries to the service. 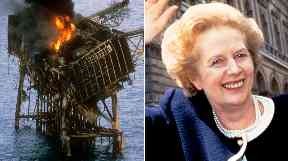 Margaret Thatcher skipped a memorial service for victims of the Piper Alpha disaster so she could meet a top Conservative fundraiser. The Prime Minister was invited to the event at a church in Aberdeen five days after the tragedy on July 6, 1988, which claimed the lives of 167 men. After being told it would mean cancelling a series of meetings, she sent Scottish secretary Malcolm Rifkind and energy secretary Cecil Parkinson. Instead the Prime Minister held a lunch with industrialists in London and met Tory fundraiser Lord McAlpine. She also attended an event at Westminster marking the 300th anniversary of the Glorious Revolution. Thatcher’s decision was revealed in newly declassified documents held by the National Archive. Diary secretary Tessa Gaisman wrote to the Prime Minister on July 11, 1988, telling her that if she wanted to travel to Aberdeen “time would be tight”. “You could do it if you left the house at 11.40am… and went by helicopter from Wellington Barracks to Northholt and then flew up to Dyce,” she said. The Prime Minister had travelled to Aberdeen on July 8 to meet victims and hold a meeting with Piper Alpha operator Occidental Petroleum. She flew to Scotland alongside the Scottish secretary and was urged by her private secretary, Dominic Morris, to use the flight to lobby Rifkind on “outstanding policy issues”. The newly-released documents also include a letter from energy advisor Greg Bourne, where he warns the Prime Minister: “Trade unions will try to make political capital out of this catastrophe. An inquiry held in the wake of Piper Alpha led to more than 100 improvements to safety in the North Sea. It remains the worst offshore disaster in history. A survey has been launched to block the return of controversial offshore helicopters to the North Sea. A website, purported to be associated with Unite the union, is hosting the questionnaire entitled ‘Do Not reintroduce the Airbus H225s and AS332L2s airframes in commercial operations in the UKCS’. The two models of Super Puma helicopters have been banned from flying in the North Sea until recently as an investigation into a fatal crash off Norway continues. The Civil Aviation Authority made moves to lift the flight ban earlier this month despite there being no root cause of the tragedy off the Norwegian island of Turoy identified. However the survey claims that there is “no public confidence” in the Airbus aircraft and calls for stakeholders to back the “permanent cessation” of Super Puma operations in the region. A statement on the website said: “Unite members have a vital role in making this campaign a success. Together we need to show that workers will not accept a return ‘business as usual’ and will express a vote of no – confidence in the Airbus Superpuma 225s airframes. “Unite members have told us, their Health & Safety is paramount in the offshore sector. We are asking our members and all offshore workers and their families and the general public to visibly support this campaign and future health and safety campaigns in the industry. “To win, you will need to show publicly your support and you will need to build the campaign through speaking to your colleagues, gaining their support and asking them to play an active role. Unite the union has been contacted for comment.